Fantastic breakfast at the Hotel Florence, almost made up for the fact that there was a thunder storm going outside and the rain was pouring down. Despite an early breakfast everything conspired against an early start: the weather; an unsuccessful search in the village's two shops for some ohrstopsel (earplugs); and then going west out the village instead of east; by the time I was walking on the route proper it was 10.30. The rain didn't stop until midday and the first part of the walk, a climb up and along a forest trail to the ski resorts of Rinnen and Berwang, was not that exciting. Lots of trails around Berwang and I didn't want to believe that the correct route involved following the river out of town and loosing nearly all the height I'd gained since leaving Weissenbach. 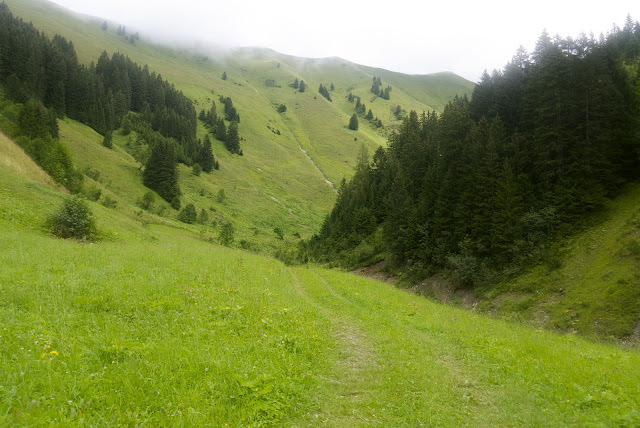 Eventually the trail stopped descending, turning abruptly into lovely and very remote Weittal Valley and started on the main climb of the day up to the pass at Sommerbergjochl, a climb of about 1,000 metres. 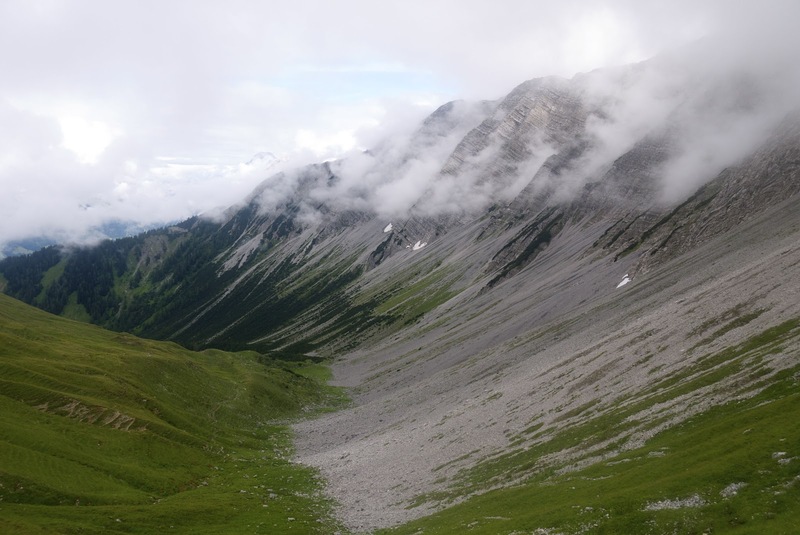 Really dramatic scenery, the pass sandwiched between the Bleispitze Peak and the Gartner Ridge. A lovely walk and I had it all to myself (apart from the cows) - summer pasture on one side and huge limestone cliffs on the other all made a bit more dramatic by the wispy low cloud - a remnant from the morning's storm. 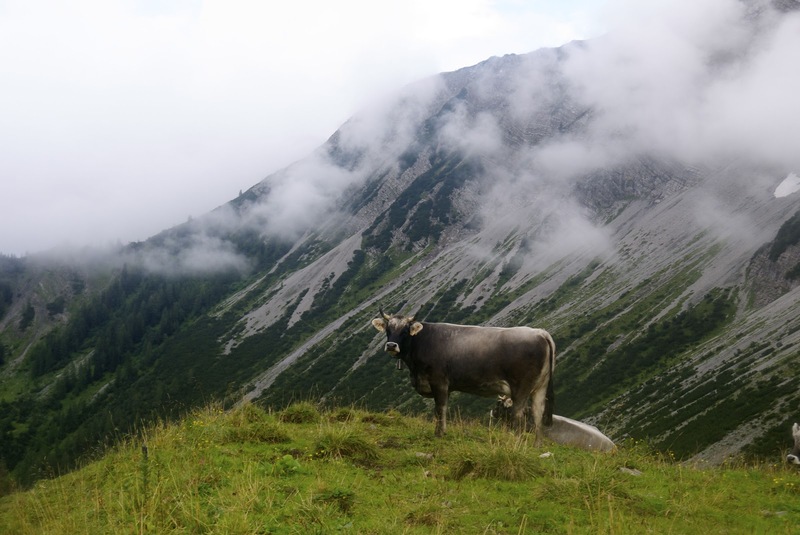 The best part of walk was the Gartner Tal Valley, on other side of the Sommerbergjochle pass. A classic isolated U shaped valley occasionally illuminated as the sun broke through - amazing contrasts of light and shade. It was now about 5 o'clock but the walk still had a sting in the tail. After heading down the valley the route almost goes back on itself going straight at the cliffs on the right. After zig-zagging in increasingly short order for about forty minutes I was at the top again where a sign announced that I was five minutes from the Hutte. It had been a big walk, 27.4 kilometres with a climb of nearly 1,800 metres. Heaven at a Hutte - the landlady, who is standing at the door greets me and says, "you must be Mr Hayes" and then asks if I want to sleep in the dormitory or have my own room! No choice and no ohrstopsels needed tonight - bliss!